Talita and Maria Elisa celebrate the gold medal in Shanghai, photo by FIVB. 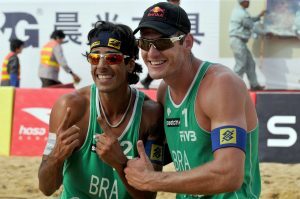 RIO DE JANEIRO – In its second stop this season the Beach Volleyball World Tour looked more like a national competition as both Brazilian doubles teams grabbed gold. In a total of twelve medals disputed so far this season by male and female teams, eight have gone to Brazilians – four gold, two silver and two bronze. Having topped the podium in both male and female categories during the tour’s opening event in Brasília, Brazilian doubles were again the winners in the second stop, in Shanghai, China. On Saturday, May 2nd, Brazilians Talita Antunes and Maria Elisa Antonelli defeated the Chinese double Wang Jie and Zou Man in straight sets (21-17 and 21-13). Before getting to the finals, Talita and Maria Elisa had eliminated another Brazilian duo, sisters Maria Clara and Carolina Solberg, who ended up in third place after defeating Germans Sara Goller and Laura Ludwig. “You need to have a great blocker to constantly win the World Tour, and Talita is considered to be one of the best in the world. My job is to play well in the back in order to make our team competitive. That’s what we did this week”, analysed Maria Elisa, after receiving her second gold medal in a row at the Shanghai event having won in 2008 with ex-partner Renata Ribeiro. Partners Harley and Alison defeated Cunha and Solberg in the finals, photo by FIVB. On Sunday, May 3rd, the men’s final featured two Brazilian teams. Harley Marques and Alison Cerutti scored a 21-14 and 21-15 win over Pedro Cunha and Pedro Solberg to take the gold medal. Harley and Alison already have two medals this season, having come second in the competition’s first stop the week before. Sunday’s men’s final was extra hard-fought as Harley and Pedro Solberg used to be team mates and had won the two last Shanghai events together in 2007 and 2008. Harley praised his new partner, Alison, and celebrated Solberg’s second place: “I love playing in Shanghai, we’re very welcomed by the people. Alison was very important for this victory, as he’s becoming one of the World Tour’s best blockers. I’m even happier because Brazil has two doubles in the podium”. In the third place playoff, Germans Julius Brink and Jonas Reckermann defeated Kais and Vesik, from Estonia, after scoring a 21-17 and 21-9 win. The Shanghai stop was the World Tour’s last double gender event. The next men’s only event will be held in Rome, Italy, from May 12th to May 17th. Brazil will be represented by seven doubles pairs: Alison/Harley, Ricardo/Emanuel, Pedro Cunha/Pedro Solberg, Márcio/Fábio Luiz, Hevaldo/Benjamin, Thiago/Jan and Franco/Nalbert.